← Spending Time with Friends? Ever feel as if you’re fenced in — to a job, a situation, a relationship or a commitment? 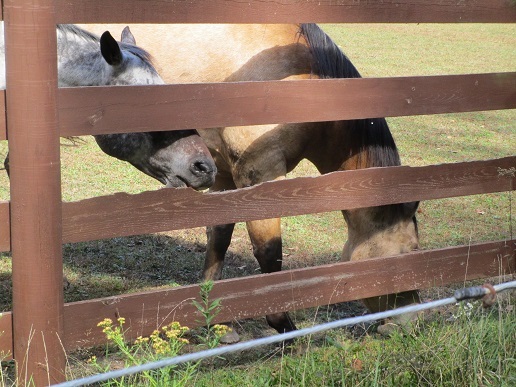 If you’ve ever noticed, horses may have a large yard in which to run, but they always seem to want to eat the grass on the other side of the fence…or in this case, chomp on the fence to hopefully get onto the other side. Why are we not content with where we are, who we are or what we’re doing? Why are we always trying to get somewhere else — to a different age, another place or a better job? Unlike the horses, we tend to fence ourselves in. We make choices based on pressures from society, family or finances we sometimes later regret. So how do we open the gate or get beyond the prison we’ve made for ourselves? It’s really very simply. We simply follow our excitement. If you’re excited abo ut something or someone, time flies by quickly. Work doesn’t feel as if it’s work at all. We look forward to spending time with those whose company we enjoy. Doing what brings excitement let’s us enjoy where we are right now. We’re not trying to get somewhere else or watching the clock until the duty’s done. 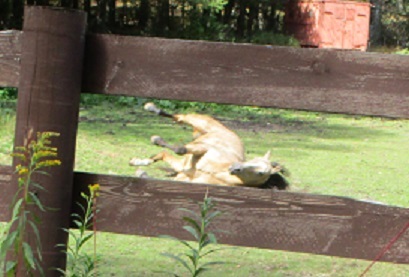 This gal decided to roll around on the ground, enjoying the sunshine and a nice scratch on her back. Next time you’re feeling fenced in, why not take a moment to see how you can bring excitement to your day? This entry was posted in Nature, Passion and tagged Nature, Outdoors, Passion, Spiritual living. Bookmark the permalink. 1 Response to Feeling Fenced In? Some fences are permanent: our physical bodies can only do so much, our past cannot be changed. Other fences can be expanded: our intellect and talent, our goals for the future. Some fences need to be removed altogether: limits set by other people, outdated thinking. When we have a balance of contentment and excitement, our fences may fade away.